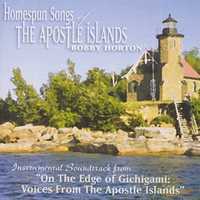 In 2003, I had the privilege of producing the musical soundtrack for "On the Edge of Gichigami: Voices From The Apostle Islands". This inspirational film by Ann Tubiolo is shown daily at The National Park Service Visitor Center of The Apostle Islands National Lakeshore on Lake Superior. Presented here are expanded versions of the songs I played on the soundtrack. Some are traditional melodies that were popular with the people who lived in the area, while the others are my own compositions. Like all my other recordings, I created all the arrangements, played the instruments, and recorded here in my home production studio (on TASCAM DA-88 digital recorders) – hence the "Homespun" in the title. I do hope you will enjoy these tunes!